It’s that time of the year again. Don’t you just relish the colourful rangolis, the family get-togethers, the aarti, and the crackers around (ok, maybe not the crackers if you are eco-conscious like us and hate both noise and air pollution, or just plain love it being peaceful around). The piousness in every household, it’s also the time when we reconnect with our near and dear ones. I’m sure every Indian has a special bond with this festival. Traditionally however, Diwali wasn’t meant to be such loud event. As I am sure, almost every one must have written an essay on “My favourite festival- Diwali” atleast once in their high school life, I wouldn’t delve much into the obvious facts- that Diwali is the festival of lights or “diyas”, people exchange sweets (and gain weight) during this time; it’s a time when near and dear ones get together and people burst crackers etc etc. There are many versions of why we celebrate Diwali though. The one common and almost widely accepted story is that the Goddess of Wealth- Laxmiji is worshipped because she descends on earth and blesses homes and hearths of her most loyal devotees. My grandma’s version was that the reason we light lamps during Diwali is to signify the path of the Goddess and to welcome her. “Laxmi Pujan” on 4-5 days is therefore an integral and inseparable part of the festival. The other very mythological tradition behind celebrating Diwali is the fact that “Lord Rama” and “Sita” finally fulfilled their promise of the 14 year long exile and return back to ancestral home in Ayodhya. The diyas signify the happiness of his subjects upon their return and their happy anticipation that he will soon assume the throne. The other (probably lesser known) version of celebrating Diwali is to celebrate the victory of Lord Krishna over the demon king Narakaasura. Lord Krishna’s victory is celebrated by the people lighting lamps in order to express their happiness and gratitude of being relieved from the oppressive ruler. Another mythological version most believed in south India is that king Bali, an asura (so should be inherently evil) but a noble king was beloved by his subjects. Upon winning grace from the Gods, king Bali received the blessing of being able to descend once on his beloved earth to meet his loyal subjects, who in turn welcome him royally by lighting the entire kingdom with lights. No matter which story you follow and believe, the common thread between all stories is that people celebrate the victory of good over evil, and express it by lighting diyas. What really matters is that you celebrate the festival with fervor, no matter which region of India you come from. That is what truly Unites us in our Diversity. What I find most interesting however, is that every year, the onset of Diwali is marked by “Spring cleaning”. People might have been hoarders for the entire year, but two weeks before Diwali begins, it’s time to throw away or donate. And just as you see cleaner corners and perhaps rediscovered spaces in your house that you forgot existed, you feel light, even mentally. That’s the beauty of cleaning, isn’t it? Almost all Cleanliness obsessed folks will agree with me. And that is the whole point, make way not only for new jewellery and clothes, but also new ideologies, new blessings, perhaps new opportunities even. We at Talent Discoveri see Diwali as a golden opportunity to refresh our approach towards our ambitions- of providing superior quality talent across our clients. Each Diwali as we sit down to review and revise, we rediscover the light of knowledge of ways to not only improve our performance, but also to make our associations more purposeful. 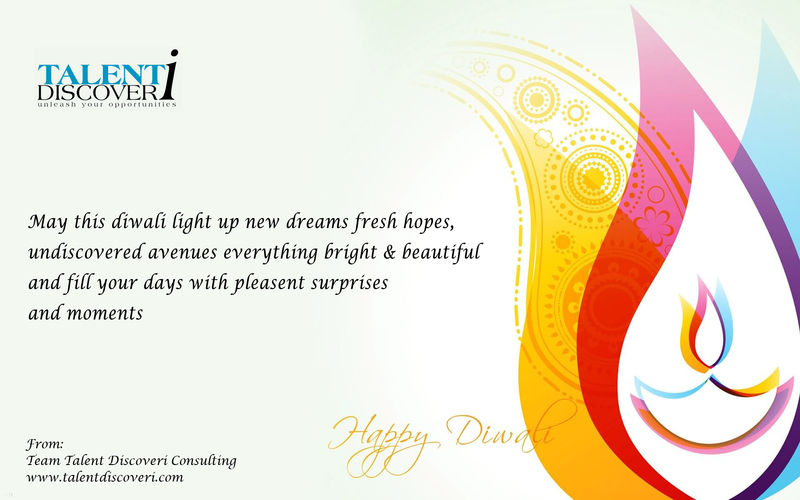 Team Talent Discoveri Consulting wishes you a happy, safe and an abundant Diwali.